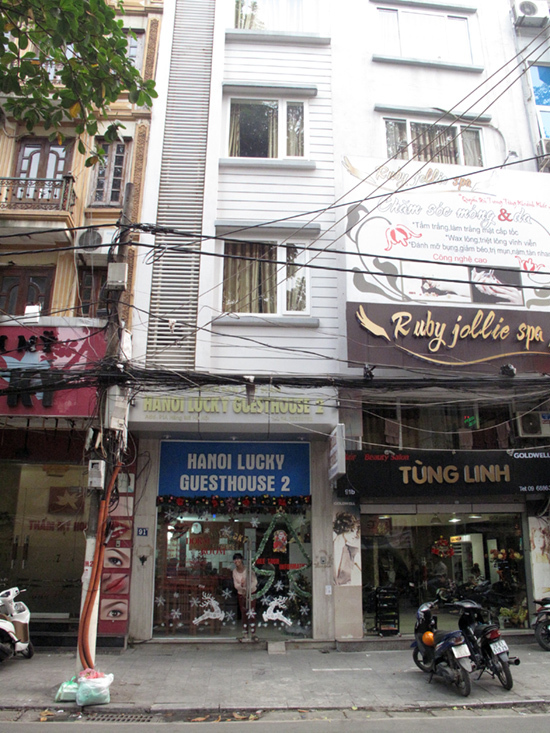 Hanoi Lucky Guesthouse 2 in Hanoi’s Old Quarter offers a very warm welcome, with good value, clean rooms plus comfortable dorm beds, making it a great option for budget travellers. Ad Book now! Rates from US$12.6++. Average rating 7.3 from 70 reviews. The bedrooms lack frills — no pictures, fridge nor safe, and certainly no robes or slippers — but they do come with a modern wall-mounted TV and a good-sized wardrobe and bedding is clean and adequate. Don’t expect a balcony either — unless you consider a space the size of a small wardrobe counts. Still, it’s useful if you smoke or want to let in some fresh air. No frills — except the personalised bed runner. Bathrooms are only wet rooms, but they’ve been fitted with good quality white goods and are well tiled. Toiletries do not extend beyond a small pink soap. One bonus is that windows are double-glazed; although located at the quiet end of frenetic Hang Ma Street, street noise is still notable and the double-glazing definitely cuts out a lot of it. We’d still recommend going for a room on a higher floor if available though, to further reduce disturbance — another bonus, for a lower priced hotel, is that there is an elevator. Not much from the outside. 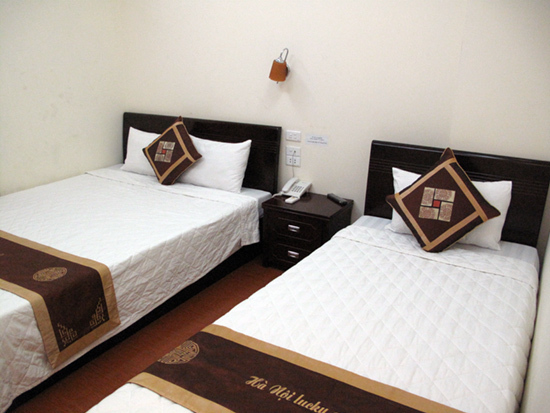 Double rooms go for US$18, with a small triple going for US$21. Price includes a basic breakfast of eggs, bread and jam, served up in a small reception area where you can also grab a drink and set up your laptop to update your travel blog. If you’re a single traveller, you will get a US$2 discount on the price of a double room, or you can check into their decent dorm room for just US$7. 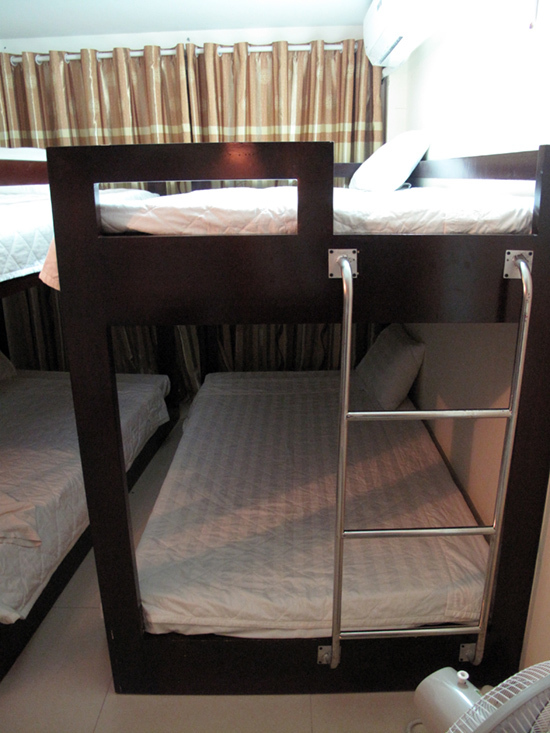 The dorm boasts four beds (two sets of bunk beds) which are good sized singles and the room, although small, is bright. 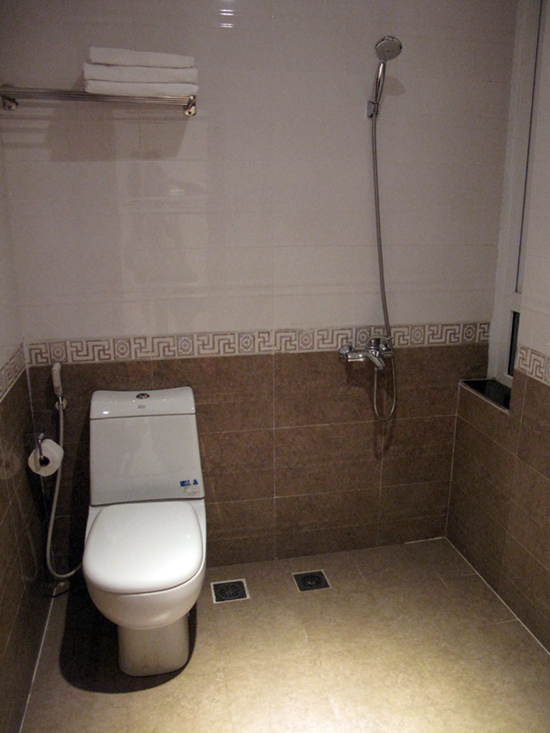 The disadvantage is the bathroom, which is down one flight of stairs and very small. It’s clean though with a shower and is only shared with your three dorm mates. When we visited the rest of the hotel was full but only two dorm beds were occupied, so you may strike lucky and get the room — and bathroom — to yourself. If Hanoi Lucky Guesthouse 2 is fully booked staff may be able to fit you in round the corner in Hanoi Lucky 1, which is slightly cheaper.